Known for its many uses - Unica has been named as the one solution for anterior restorations. A simple and ideal matrix, Unica is the ideal tool for class III, IV, V, direct stratification composite veneers, and shape modifications. In this clinical case, Dr. Carlos Fernández Villares illustrates how Unica's contoured profile allows for an anatomic restoration and an aesthetic end result. 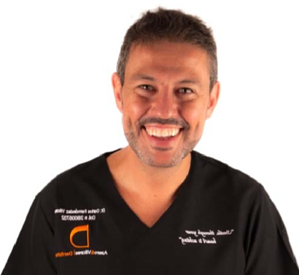 Dr. Fernández Villares graduated in Dentistry at University of Madrid in year 2000 and continued his postgraduate studies in Aesthetic Dentistry. Dr. Fernández Villares is very active as Professor in the Master in Restorative Dentistry based on New Technologies at the UCM and Collaborating Professor of the Master of Aesthetic Dentistry at UCM. He is also Professor of the Continuing Education courses in Dental Aesthetics at the UCM since 2006, and co-director of the Master in esthetic oral rehabilitation in the UCAM university. Besides his teaching activities, Dr. Fernández Villares is having a private practice in Madrid, Spain. Frequent speaker and lecturer in courses at national and international level in Restorative and Aesthetic Dentistry, he is member of the Spanish Society of Esthetic and Prothesis (SEPES), and honorary member of the international group Style Italiano and regular contributor to national and international dental publications. A young girl with two ceramic veneers in the laterals came to our attention to improve her aesthetics. We proposed to substitute the veneers with new composite ones. The creation of composite veneers not only satisfied the patient’s desire to know the final anatomy before the completion of the treatment but provided an easier solution to modify than using ceramic veneers. The following case study shows the step-by-step procedure of the composite veneer built up using Polydentia’s Unica anterior matrix. 1. Pre-operative view showing two ceramic veneers on laterals 12 and 22. 3. Old ceramic veneers have been removed first. Adjacent teeth have been protected using a metal matrix before proceeding to sandblasting the surfaces with aluminum oxide and water. Sandblasting allow us to eliminate some remains of the previous restoration and pave the way for the adhesive procedure. 6. Unica anterior matrix placed on the tooth. The contoured proximal walls of the matrix provide the anatomy and the emergency profile required for the restorations in the anterior region. 7. Fixing Unica anterior matrix using wooden wedges. 9. After removing the matrix an optimal contour is obtained, only finishing and polishing procedure are required. 10. Composite has been covered with oxalate gel and polymerized for 20 seconds. When dealing with direct restorative procedures of the anterior teeth, one important aspect is the management of the cervical areas. Often, retraction with gingival retraction cords or a rubber dam will not allow to obtain a proper gingival profile. The unique design of the Unica anterior powered by Style Italiano makes this matrix an essential and very efficient tool since it enables us to work both in the interproximal and cervical areas at the same time.